See a website of supplementary material and sample pages (PDF format, 8.2Mb). America has some of the most varied and dynamic weather in the world. Every year, the Gulf Coast is battered by hurricanes, the Great Plains are ravaged by tornados, the Midwest is pummeled by blizzards, and the temperature in the Southwest reaches a sweltering 120 degrees. Extreme weather can be a matter of life and death, but even when it is pleasant—72 degrees and sunny—weather is still central to the lives of all Americans. Indeed, it’s hard to imagine a topic of greater collective interest. Whether we want to know if we should close the storm shutters or just carry an umbrella to work, we turn to forecasts. But few of us really understand the science behind them. All that changes with The AMS Weather Book. The most comprehensive and up-to-date guide to our weather and our atmosphere, it is the ultimate resource for anyone who wants to understand how hurricanes form, why tornados twirl, or even why the sky is cerulean blue. Written by esteemed science journalist and former USA Today weather editor Jack Williams, The AMS Weather Book, copublished with the American Meteorological Society, covers everything from daily weather patterns, air pollution, and global warming to the stories of people coping with severe weather and those who devote their lives to understanding the atmosphere, oceans, and climate. Words alone, of course, are not adequate to explain many meteorological concepts, so The AMS Weather Book is filled with engaging full-color graphics that explain such concepts as why winds blow in a particular direction, how Doppler weather radar works, what happens inside hurricanes, how clouds create wind and snow, and what’s really affecting the earth’s climate. "Pilots and students of aviation will find relevant information throughout the book—especially in the chapters on winds and currents, global appterns (which also addresses fronts), weather observation, forecasting, and thunderstorms and tornados." 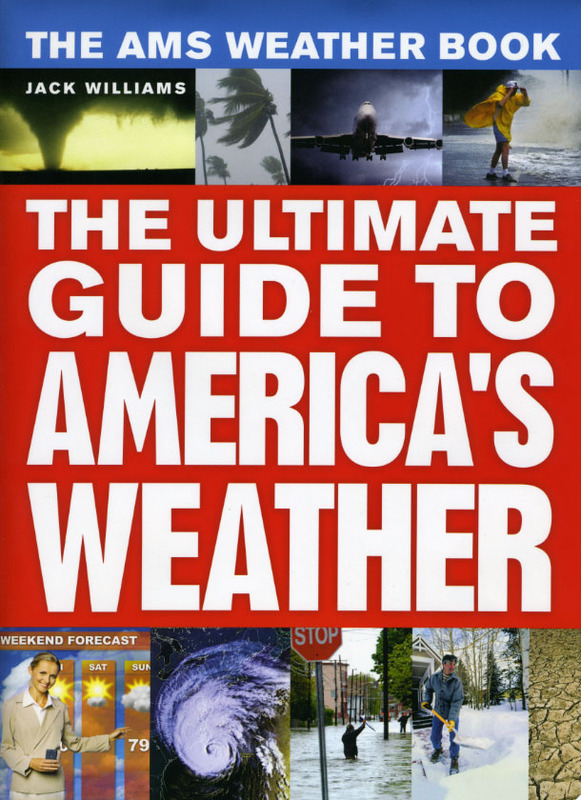 "A clearly written, profusely illustrated narrative guide to weather...with its attractive, easy-to-understand graphics, [it] offers a useful, engaging basic introduction to a wide variety of weather-related topics. Highly recommended." "[The book] fits the description of being ’new and improved’ as it is both. It is full of the same type of rich color explanatory graphics from before but they are even brighter, csisper and up-to-date. . . . Though brand new right now, I am sure that soon this will be another of my dog-eared, close at hand favorite weather books." "I give [this book] my highest recommendation.. It not only belongs on every weather lover’s bookshelf (alongside its predecessor and Jack Williams other books), but also makes a wonderful gift for anyone beginning their interest in weather and meteorology. . . . A great one ffor your summer (and any season) reading list."